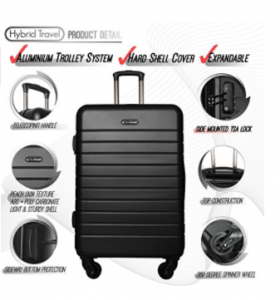 HyBrid Travel 3 Piece Luggage Set by HyBrid Company LLC came out on the market at the beginning of 2018. 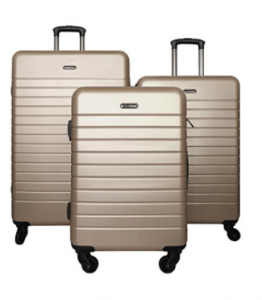 It is a very sturdy yet lightweight hard case spinner set of a 28-inch large, 24-inch medium and 20-inch carry-on size suitcases for your personal and business trips. You will get them shipped nested into each other and the packaging may reveal the contents, and you can store them fitted into each other. The suitcases in this hardshell set is made of hundred percent solid ABS (Acrylonitrile-Butadiene-Styrene) and polycarbonate with aluminum trolley. They are large inside to fit in a lot of your stuff and can also be expanded by two inches or about twenty five percent, so you can pack even more. Each one has four spinner wheels that can move in all directions- 360 degrees. 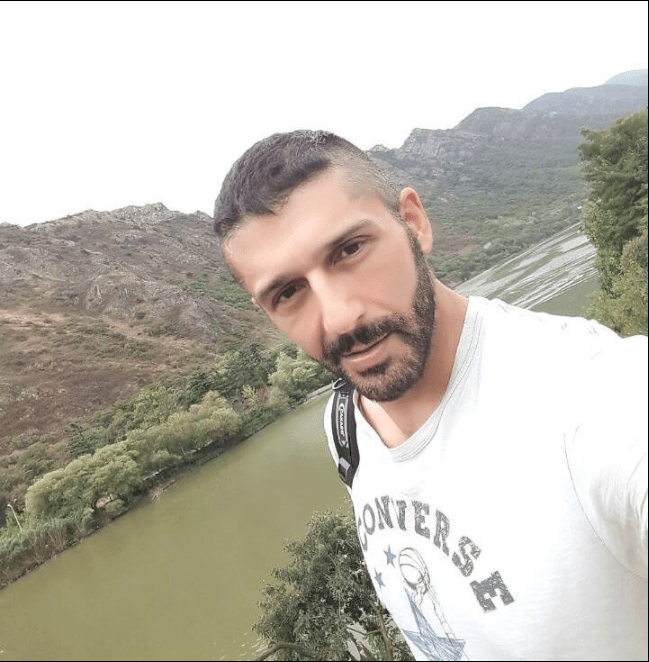 And the bags are very simple to manouver- you may push and pull them easily with also the help of the push-button heavy-duty metal telescoping handles. It is great to have four wheel spinner wheels as it can be quite hard to handle especially the heavier and larger bags. You can pull or push your luggage with just a single finger on airport terminal or parking grounds without any strain on your shoulder, elbow or wrist. The side and top handles are nicely padded for a comfy grip when you lift them vertically or horizontally. They even come with an integrated three-digit combo locks that you see in the photos and are TSA-approved. So only the TSA luggage inspector at the airports can open it with a universal key and check the contents of your luggage without needing to cut off the lock. And you will know that your suitcase has been tampered with thanks to a unique feature of TSA locks. These bags are shiny whichever color you choose to buy and some of them have protection film sticker that you may confuse with damage and that you need to peel off before seeing the shiny exterior. They are very much resistant to impact and any rough treatment by the airport staff thanks to the very sturdy ABS + PC materials that make it both lightweight and resistant to impact. ABS is a type of regular thermoplastic which is a robust and lightweight material- lighter than polycarbonate but solid enough to protect your stuff. The bags have the fuly lined interiors with different compartments including a mesh pocket and elastic cross ribbons to keep your clothes in place and everything better organised. The small cabin bag measures 15.7 X 8.9 X 20 inches without the wheels, the medium bag is 17.7 x 10 x 2.4 inches and the largest suitcase is 20.5 X 11.4 X 28.3 inches. The aluminum material used on the luggage set is oxidized to help maintain the colors over time. The surface is prone to scratches and fingerprints but you shouldn’t worry about the durability of the exterior or the product overall. You have a total of 29 colors to choose from and you can view them all on the Amazon product page. This set definitely offers very good value for money and the price is quite low for what you’re getting in terms of durability, functionality and design.